HONG KONG--(Marketwire - October 14, 2010) - Sheldon G. Adelson, the chairman of Las Vegas Sands Corp. (NYSE: LVS) and its majority-held subsidiary Sands China Ltd. (HKSE: 1928), was honored today by the Hotel Investment Conference Asia Pacific (HICAP) as he received the conference's prestigious Innovation Award. HICAP is the largest and longest-running hotel investment conference in Asia and its Innovation Award recognizes and celebrates a person who has created uniquely innovative products, services, ideas, or processes which have expanded, enhanced, and advanced the hospitality and tourism industries in the Asia Pacific region and beyond. 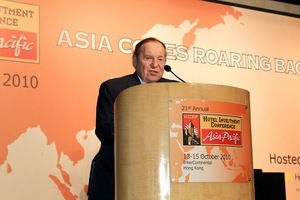 "We are delighted to be presenting the HICAP Innovation Award to Mr. Adelson. He is a truly innovative leader and visionary," said Jim Burba, president of HICAP co-host BHN. "The Singapore and Macau resort projects, in particular -- are game changers for the hotel and tourism industry in the region." "As an entrepreneur it is extremely satisfying to receive an award which celebrates innovation. Throughout my business career I have focused on challenging myself and those around me to test conventional wisdom and explore all alternatives in an effort to reach the best results," said Mr. Adelson. "As a company, we appreciate the tremendous response our properties in Asia have received and we look forward to setting the bar even higher as we continue our current development plans and look to other opportunities in the region," concluded Mr. Adelson. Las Vegas Sands Corp. (NYSE: LVS) is a Fortune 500 company and the leading global developer of destination properties (integrated resorts) that feature premium accommodations, world-class gaming and entertainment, convention and exhibition facilities, celebrity chef restaurants, and many other amenities. THE VENETIAN® and THE PALAZZO®, Five-Diamond luxury resorts on the Las Vegas Strip, are among the company's properties in the United States. In Singapore, the iconic MARINA BAY SANDS® is the most recent addition to the company's portfolio. Through its majority-owned subsidiary Sands China Ltd., the company also owns a collection of properties in Macau, including THE VENETIAN® Macao, Four Seasons Hotel Macao and the Four Seasons-branded serviced-apartments at its COTAI STRIP® development, as well as the SANDS® Macao on the Macau peninsula. The company is currently constructing a 6,400-room complex at the COTAI STRIP, which will feature the Shangri-La, Traders, Sheraton, and St. Regis hotel brands. Las Vegas Sands is also committed to global sustainability through its SANDS Eco 360 program and is an active community partner through its various charitable organizations.